The Enemy Of Your Fireplace, Water! Water can cause more damage than fire or lightning combined – a lesson learned long ago by the Wicked Witch of the West. And it applies to your chimney, too. Prolonged contact with water can deteriorate brick, mortar and tile and corrode steel and cast iron. Expansion from the freeze/thaw effect can cause even more damage. The result can be cracks or gaps in your chimney where creosote can collect and noxious gases can escape into your home – which can cost you big bucks in repair bills. Install a chimney cap. Also called a rain cover, a chimney cap is the most inexpensive way to prevent water damage to a chimney. Your unprotected chimney’s flue collects water and funnels it directly inside the chimney, but a strong, well-designed cap keeps water (and birds) out. Caps also keep chimney sparks inside, where they belong. Waterproof your chimney. Common brick and mortar are like sponges, wicking moisture to the chimney interior. Add a vapor-permeable waterproofing agent to let moisture out, but prevent it from coming in. Never use paint or any non-vapor-permeable water sealer because it will trap moisture inside the chimney, hastening deterioration. 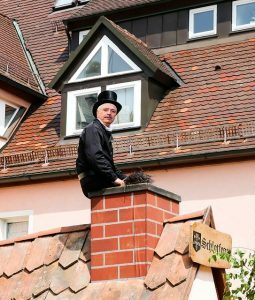 Repair or replace a damaged chimney crown. Most chimney crowns are made of common mortar, which does not withstand years of weather. Replace yours with one made of a Portland cement-based mixture that creates an overhang, or drip edge, projecting beyond all sides of the chimney by at least 2 inches. Repair or replace flashing. Flashing keeps rain from running down your chimney under your shingles and into your home. Use an L-shaped piece of metal that extends from under the roofing shingles up the side of the chimney. Then, use counter flashing that overlaps the base flashing and is sealed into the chimney’s masonry joints. Hire a CSIA Certified Chimney Sweep from www.firstchoicechimney.net. When in doubt, get it done right by hiring a chimney professional. CSIA Certified Chimney Sweep from First Choice Chimney have earned the chimney and venting industry’s most respected credential by passing intensive exams based on fire codes, clearances and standards for the construction and maintenance of chimney and venting systems. This knowledge allows them to expertly diagnose and solve chimney and venting problems.